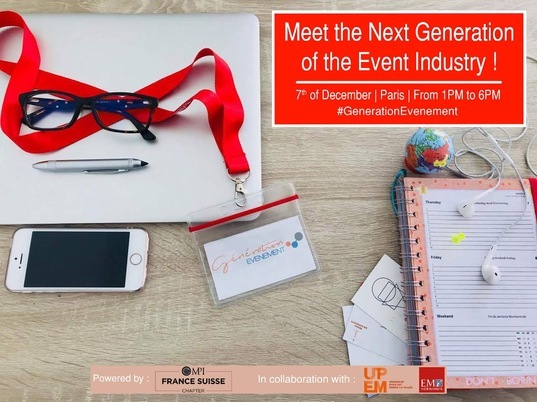 ‘Génération Evénement’ is a half-day event powered by MPI (Meeting Professionals International) and dedicated to connect future leaders with professionals from the event industry. The event will take place at “La Galerie Joseph - Paris 3ème” on Thursday 7 December next. It will gather around 120 master students from several French Universities. Through a series of 8 workshops, Génération Evenement will enable attendees to interact with local or international experts of the event industry and receive valuable mentoring. Most sessions will be held in English including the key note address. A cocktail will close this day and will allow students and professionals to share more and network in a relaxing and convivial way. This MPI meeting is co-organised by Master students in International Event Management from both schools, Ecole de Management de Normandie and UPEM / Université Paris-Est Marne-la-Vallée. The students are motivated and look forward to welcoming all visitors to this free event! 1- International Success: Tips and steps to create an international network to succeed. 2- Meeting Architecture: Meeting Architecture is the discipline of designing and executing meetings and events based on measurable objectives to improve the learning, and motivation of participants. This work is aiming to influence the members’ professional actions leading to impact and improving ROI (return on investment). 3- Digital in the Event Industry: How to use digital in events and improve the participants’ interaction with new technology. 4- How to determine the speaker that suits your event: What we should know before recruiting a speaker and which are the qualities they should acquire to fit at your event. 5- Client expectations facing the new generation: What do the clients expect from their purchases and how to encounter the new generation challenges. The right way to respond and personalize their experience implementing the new technology into the services we offer. 6- Successful networking: The best technical skills to form mutually beneficial relationships that will provide assistance and support to each other over time, creating the best impact in our personal brand. 8- Collective intelligence and visual tools: These tools will introduce you to the power of the collective intelligence. This generates implication, innovation, successful projects and personal thriving in any event.